Use Social Buttons to link to Facebook, Twitter, Instagram, and more. The social icon buttons are great for linking to Facebook, Instagram, Twitter, YouTube, Email, and more. Add Social Buttons to your page for Facebook, Twitter, Instagram, YouTube, Snapchat, Vimeo, and more. Link the social icons to your social media account pages. Adding your social accounts to your Shogun page is simple with the Social Element. Simply drag the Social Element onto your page to get started. You can use the Add New Profile button to add new social accounts. Changing which icon is shown for the social account is simple, simply click on the Choose Icon dropdown menu and choose the social media you would like to display. Shogun allows for you to customise the look of your Social Element. 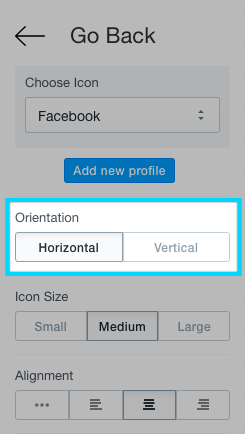 You can decide on the orientation of the icons that are displayed - horizontal, or vertical. You can also change the size of the icons in the Social Element to be large, medium, or small. Changing the color of the icons of the Social Element is super simple. 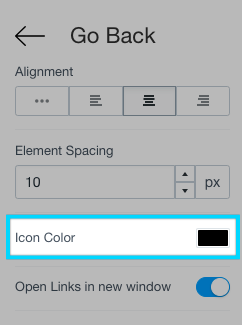 Check out the color picker that we offer to allow you to set them to a color of your choice. Sometimes you want to keep your users on your site, but also want to send them to your social media pages. 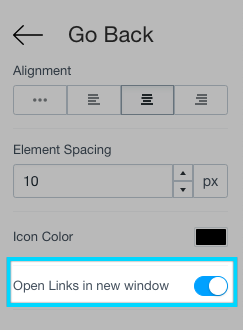 You can use the 'Open Links in new window' toggle to allow for this.